Home / Giveaways / Enter to WIN an Instant Pot! Would you absolutely LOVE to win an Instant Pot?? I thought so. Scroll down and enter at the bottom of this post! But before that, you can read about the Instant Pot and everything this awesome machine offers. The 2018 Spring Instant Pot Giveaway has been organized by Juggling Act Mama and brought to you in part by Birch Landing Home, Bowl Me Over, DIY Candy and Doodlecraft. One lucky winner will be the recipient of an Instant Pot DUO60 6 Qt 7-in-1 Multi-Use Programmable Pressure Cooker, which also has functions of a Slow Cooker, Rice Cooker, Steamer, Sauté, Yogurt Maker and Warmer! How cool is that? This product has a $99 value! 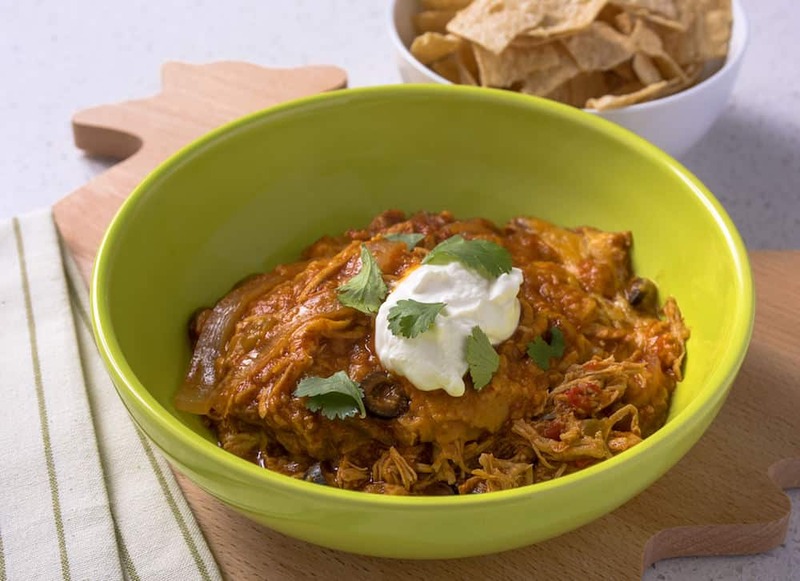 Check out our recent Instant Pot enchilada casserole! If you love making one pot meals, you’ll love this, so be sure to pin it! Official Rules and Conditions for the Spring Instant Pot Giveaway 2018: One winner will be receive Instant Pot DUO60 6 Qt 7-in-1 Multi-Use Programmable Pressure Cooker. Open to US/CAN residents adults 18+. One (1) winner will be chosen. Prize must be claimed within 48 hours of announcement or a new winner will be drawn. Prize will be delivered electronically. All entries will be verified. This giveaway is in no way associated with Facebook, Pinterest, Twitter, Instagram, Rafflecopter, Amazon or any other entity unless otherwise specified. Giveaway ends 3/30/2018. Enter using the widget below. I actually want to win this for my friend who is envious of mine! She has 5 children and a foster baby – man could she use it! I’d like to cook a chicken in it. Enjoying your blog immensely! I sure would love to win, but the blog enjoyment is there, no matter what! I would cook adobo in it. Thank you For the great suggestions and references. If I won I would make a chicken/potato/carrot stew, with ranch dressing mix and cream of chicken soup. I would be able to make Freezer bag meals and be able to control the Instant pot with my Amazon Echo to be able to have dinner ready when I get home instead of starting to cook when I get home. There are so many possibilities I can’t pick one meal! I have a chicken dish I would like to try in it. I’ve heard so much about the Instant Pot! Thanks for offering this raffle! i would make roast beast! Anything chicken!!!! That’s what we love….maybe even a chicken taco soup….we also love soups and stews!!!! First up would be pot roast with onions, carrots and potatoes. Next would be shredded beef. I would make a roast in it. I would make a chicken dish. Would love to win this Instant Pot – thanks for the giveaway. My first dish would have to be something with chicken, as we love it. I have been seeing lots of great recipes and wishing for one of these. I would probably make some type of chicken dish. I would make a beef roast. I need to up my iron levels! Lol. I want to make a roast with the fixings, then a beef dip, then a chili……. I would fix some venison in this pot. Looks like a wonderful appliance to cook supper in and lots of other goodies! hmmm, maybe a roast?? I have a feeling I don’t understand it’s full potential yet. Would be fun to learn. The first thing i would cook would be the Chili you mentioned! Thank you for the contest. I would use it to can produce from my local Farmers’ Market. I would love to make some soups with the Instant Pot! I would most likely cook a bean dish in my instant pot. I make many bean dishes, so it is hard to just pick one. But the instant pot would make my life so much easier. I would love to have an instant pot. There are so many things that it can do, that it appears to be the only pot one would ever need. I’d love to have an Instant Pot! My best friend has one and she loves it! I’d like to hard boil eggs in mine. I have heard so much about them but havent looked into them yet so it would be fun just to try it! Thanks for the opportunity! I would definitely be trying out a chicken cooked in it and also that chili looks yummy! I love Mod Podge! And I would love to win this appliance! Thank you! This is not your mother’s pressure cooker….. I would use it to cook chicken for my dog. Would save a lot of time.. I keep hearing great things about Instantpots and I think I would use it quite a bit if I won. If I won, I would make my all time fav comfort food – Beef Stew! I’d like to cook caldo de pollo mmm! I would make chili or a veggie dish like tater tot casserole for my hubby. I’d start with Beef Stew! Some great meat for taqueria style tacos! Mississippi Roast! Potatoes and Carrots. Taco soup! Chicken Enchilada soup! I’d make a lemon garlic chicken with smashed potatoes, came across a recipe and it just sounds so good! I would make chili, chicken and beef dishes.I have some recipes that I haven’t tried yet and I am anxious to try them out. I would make so much chicken and yoghurt! I’d make all the crock pot videos that keep popping up in my Facebook feed. I just moved from South Dakota to Colorado to Michigan to New Mexico in the last 2 years. The crock pot I had did not survive all that moving and it cracked. I haven’t gotten around to replacing it, but I’ve been thinking about an Instant Pot instead. I would love to try my recipe for ham and pinto beans….along with quite a few others! I would love to make yogurt!